She puts a liberal gloss on her father’s agenda, but can’t mask his policies’ effects. The holy scriptures of Taylor Swift (Book of 1989, Chapter “Bad Blood,” Verse 8) taught us that “Band-Aids don’t fix bullet holes.” Now, Ivanka Trump—the only woman on earth who could make Swift look like an intersectional feminist trailblazer—has emerged with a child care policy that proves the truth of this proverb. Ivanka has long positioned herself as the liberal, “feminist” face of the Trump empire. While her father racks up an ever-mounting list of sexual assault and harassment allegations, Ivanka runs a tastefully pink lifestyle brand, with a Twitter campaign, #WomenWhoWork, aimed at “celebrating” the “modern working woman.” She has also branded herself as a #thoughtleader on policies that might benefit said working women, like child care and paid family leave, though her policies to date have been (let’s put this tactfully) half-assed, cosmetic pseudo-solutions. 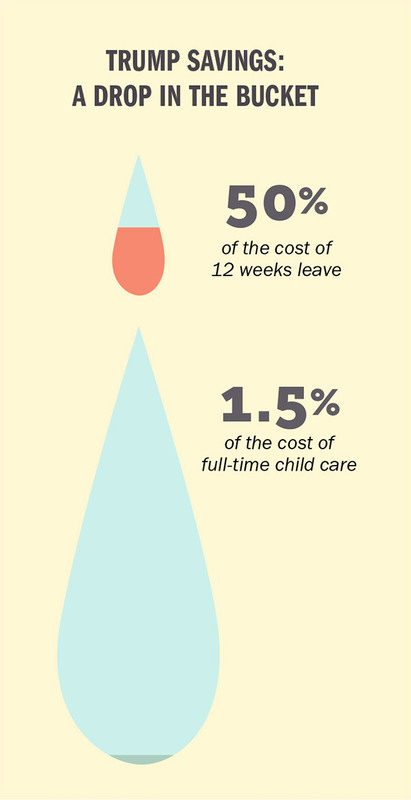 Here’s one reason those child care proposals might get dismissed as “insufficient”: They are. Ivanka Trump’s, in particular, is nothing more than a small tax deduction, the benefits of which tilt precipitously toward the wealthy. The Tax Policy Center estimates that a family with children and an income of $200,000-$500,000 would get an average annual subsidy of $450, while a family making $50,000-$75,000 would receive $150, and a family making $10,000-$30,000 would get a measly $10. Even $150 is not exactly a lifesaver, especially when you consider the average cost of full-time care for a child under 5: almost $10,000 a year (more, in some places, than the average rent). A family making the median income of $56,000 is still paying almost one-fifth of their pre-tax paycheck simply so both parents can work outside the home. And they still have to pay their child care expenses monthly or weekly, with the financial aid coming only once per year. But, granted, a $150 tax deduction isn’t nothing. The problem comes when you consider what else they’ll be paying for. For instance, one well-known fact about having a baby is that you actually have to get it out of you at some point. Prenatal care and childbirth coverage, which were dicey before the Affordable Care Act made them mandatory, are now a prime target under repeal and replace. (“Men having to purchase prenatal care” was, infamously, Illinois GOP Rep. John Shimkus’ biggest complaint about the ACA.) The threat has been deferred with the failure of the Republicans’ American Health Care Act, but, as with the repeated efforts to defund Planned Parenthood, we can reasonably expect repeal to rear its head again. The average cost of having a baby is $21,000, assuming no complications. Should there be complications, that price tag can go way, way up—to as much as $300,000. Private insurance typically covers almost 90 percent (and Medicaid covers virtually all) of it. But without the ACA mandate, good luck finding a plan on the individual market that covers maternity care, unless you purchase a special rider with a deductible of $10,000 or more. Once the child is removed from your body, you might want to spend some time with it. This, too, will cost you. Here, we get Ivanka’s much-hyped family leave plan. While a formal proposal is not yet on the table, it will reportedly cover six weeks of absence for one or both parents immediately after birth. This is admittedly better than Ivanka’s original plan, which would only have covered the biological mother. However, the new proposal, which has yet to be introduced as legislation, still covers only half of the 12 weeks recommended by experts. (The FAMILY Act, a far better plan that New York Sen. Kirsten Gillibrand (D) plans to reintroduce this year for the third time, would cover the full 12 weeks.) Under Ivanka’s plan, if our middle-class family making $56,000 a year wants to take the recommended 12 weeks, and their employers (like most private employers) provide no paid leave, it will cost them about $6,400 in six weeks’ lost income—assuming they can afford it and their bosses let them. Once you’ve invested in your child’s birth, you may wish to train it to find employment, that it may feed and clothe you in your old age. Traditionally, you could do this for free by sending it to school. Alas, public school funding is also on the chopping block: Trump’s budget cuts $9 billion in Department of Education funding. Should our middle-class couple find that their area’s public schools have become too crowded and underfunded to provide an adequate education, the average cost of a year of private elementary school (as of 2011–2012) is $7,770. Private secondary school runs $13,030 per year. Trump has set aside $1.4 billion for “school choice” vouchers, but in Indiana, the state with the largest voucher program, the average amount is only $4,000, leaving a gap for families to fill. There are other costs that are harder to ascertain, or are specific to certain families. Threatened cuts to the Children’s Health Insurance Program or the Special Supplemental Nutrition Program for Women, Infants and Children, for example, would force low-income families to spend more on healthcare and food. 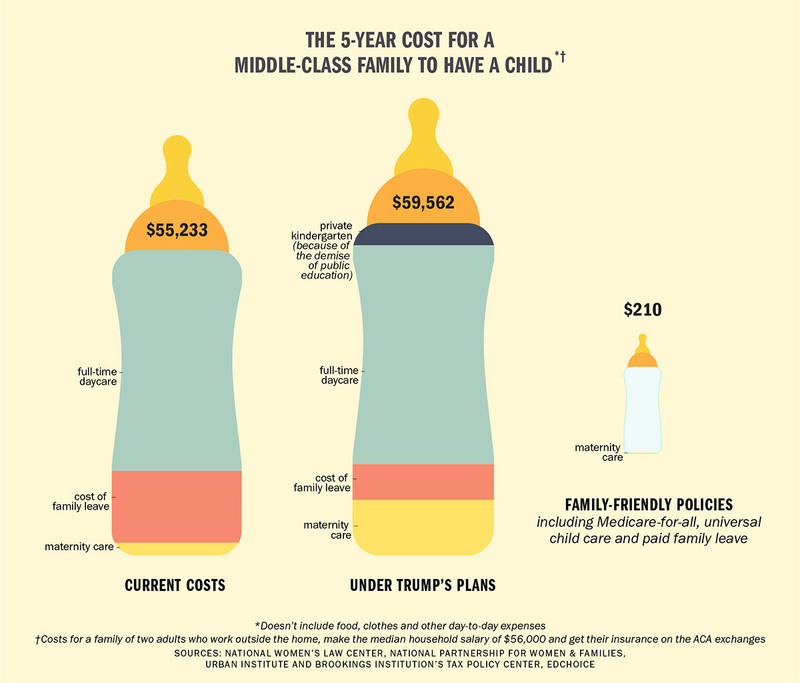 Still, if we follow our hypothetical middle-class family from conception through kindergarten—assuming they have an uncomplicated birth, need full-time child care and opt for a private elementary school—we can see that Ivanka’s family policies would add a grand total of about $7,000 to their income over five years, while Trump’s other plans could cost them more than $11,000. In all, they’d be spending $63,000 over those five years—more than a fifth of their pre-tax income—for things that would be covered by universal child care and healthcare, fully funded public education and common-sense family leave plans. Not only that, but the $500 billion-per-decade price tag of Ivanka’s plan would divert money from investments that are actually recommended by experts, such as increasing funding to the Child Care and Development Block Grant for low-income families. This is the real problem with Ivanka’s cosmetic feminism—not that it is grating, or insincere, or even that her policies are flawed, but that they actively block necessary progress while generating good PR for Trump. They’re a candy coating of feminism lite over an administration that is dead set on gutting support for working parents, and particularly single mothers. Ivanka is the Band-Aid; Trumpism is the bullet hole. While we’re praising her, working families are bleeding out. 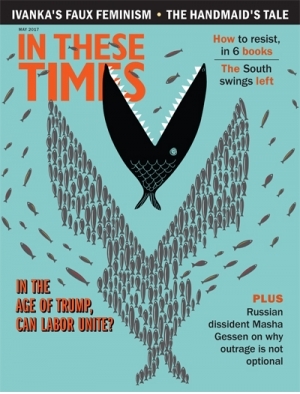 Sady Doyle is an In These Times contributor. She is the author of Trainwreck: The Women We Love to Hate, Mock, and Fear… and Why (Melville House, 2016) and was the founder of the blog Tiger Beatdown. You can follow her on Twitter at @sadydoyle.